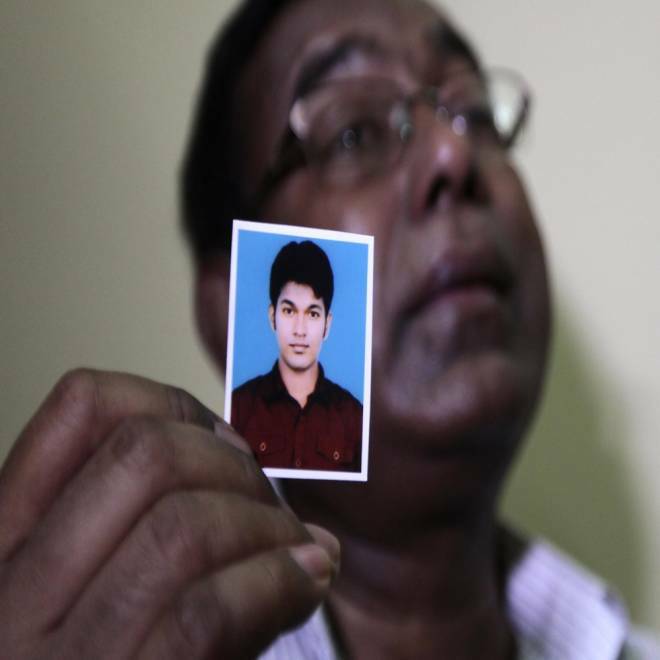 Bangladeshi Quazi Ahsanullah displays a photograph of his son Quazi Mohammad Rezwanul Ahsan Nafis as he weeps in his home in the Jatrabari neighborhood in north Dhaka, Bangladesh, in October 2012. A judge sentenced a Bangladeshi man to 30 years in prison on Friday after he admitted that he intended to use a bomb in what U.S. authorities called a plot to blow up the New York Federal Reserve Bank. Quazi Mohammad Rezwanul Ahsan Nafis, 22, who had pleaded guilty to the government's charge of "attempting to use a weapon of mass destruction" and faced life in prison, told the judge he now rejects radical Islam and apologized to the people of New York and the United States. Prosecutors had said Nafis had claimed on social media sites to have contacts with al Qaeda. "I'm ashamed, I'm lost, I tried to do a terrible thing," said Nafis, who was arrested in October 2012 while trying to detonate what he believed to be a 1,000-pound bomb hidden in a van. Instead, the van carried inert materials planted by an undercover FBI agent as part of a sting operation. Prosecutors said Nafis attempted to use a mobile phone to detonate the bogus device. Before handing down the sentence, Judge Carol Amon in U.S. District Court in Brooklyn said it was clear Nafis intended to go through with the plot in lower Manhattan. "He continually dialed the cell phone number that he thought would explode the device," the judge said. Still, she said she was "prepared to accept that the remorse he had expressed is genuine." Had Nafis been able to accomplish what he had set out to do, prosecutor James Loonam said, it would have been "a Boston Marathon style terrorist attack." In April, home-made bombs killed three people and injured 264 others near the marathon finish line. Loonam asked the judge to punish Nafis within the federal sentencing guidelines of 30 years to life in prison. The defense asked for a more lenient sentence of 20 years for Nafis, who wore khaki prison overalls and handcuffs. He had a strict, isolated upbringing and his upper middle class parents sometimes beat him for failing to focus enough on his studies, once so severely he temporarily went mute when he was 6 years old, said his court-appointed defense lawyer Heidi Cesare. As a university student in Dhaka, Bangladesh, he got his first taste of freedom and became radicalized by other students, she said. According to a criminal complaint unsealed in October, Nafis entered the United States in 2012 with a student visa, and eventually traveled to the New York City borough of Queens. It said he scouted targets for a potential attack, including the New York Stock Exchange and President Barack Obama, settling eventually on the Federal Reserve Bank in Manhattan. Nafis attempted to recruit others to his plot, and discussed his plans over social media sites such as Facebook, the complaint said. He claimed he was in contact with al Qaeda operatives overseas and actively sought out new al Qaeda connections in the United States, the complaint said. One of the individuals he brought on board was an undercover agent working for the FBI, who monitored Nafis' activities and helped arm him with the inoperable explosives, federal authorities said.